From 1640 until the 1800s it was Hartford's only graveyard. 6000 people are believed to have been buried there. there are about 415 stones still standing. 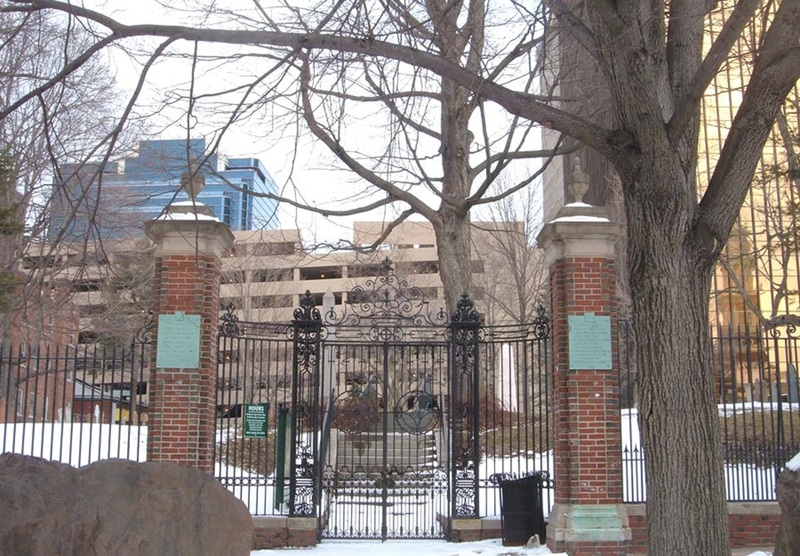 There is an African-American memorial dedicated to the 300 or more African-Americans who rest within the cemetery, as well as a monument to the first settlers of Hartford. The burying ground is located in the rear of Center Church, Main St, Hartford. There is also an entrance on Gold Street. The mailing address is PO Box 231257, Hartford, CT 06123-1257. Please note that grave marker photos may not be possible for many of the graves in this cemetery, as the markers are no longer there or no longer legible. 3 March 1640: An order concerning graves: It is ordered that Thomas Woodford shall attend the making of graves for any corpses deceased and that no corpses shall be laid less than four feet deep. None that are above four year old shall be laid less than five feet deep. None that be above ten shall be laid less than six feet deep. He shall receive for giving notice, by ringing the bell, making the grave, and keeping it in comely repair, so that it may be known in future time where such graves have been made: for the lesser sort two shillings and six pense, for the middle sort three shillings, for the biggest sort three shillings six pense." (spelling modernized and punctuation added for readability) [Src: Collections of the Connecticut Historical Society, Volume VI. p48 "Hartford Town Votes" Hartford, 1897.